"To the battleground. It will be just like advancing on untended fields." 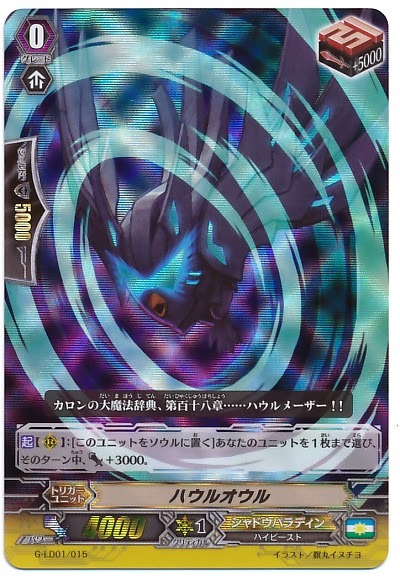 The Japanese cards of the day for the weekend are two support cards for Shadow Paladin's rebel faction, the triple rare stride Aurageyser Dragon and the clan's new first vanguard David. 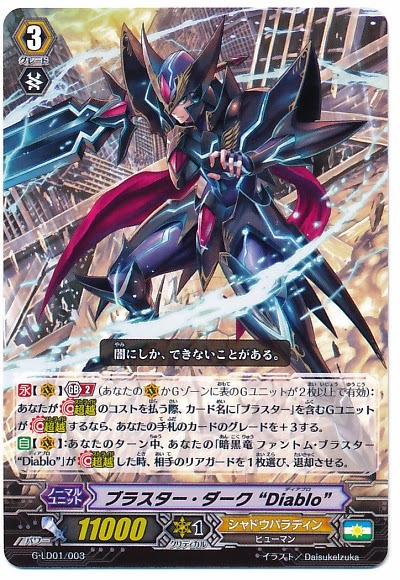 Illustrated by Takayama Toshiaki--otherwise known for Dragonic Overlord the End, “The Яe-birth,” Galaxy Blaukluger and Great Daiearth--Aurageyser is a stride revision of one of Shadow Paladin's past boss cards, Origin Mage Ildona. 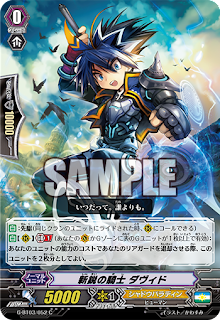 Aurageyser is currently semi-unique as a persona generation grade 4 that does not benefit from nor require two or more face-up G units for any of his card effects, and this property gives him a number of uses in different Shadow Paladin decks attempting to take advantage of the generation zone. The only other cards that function in this way have specific heart requirements, which Aurageyser does not. 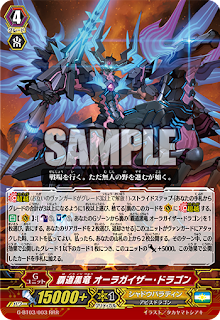 AUTO (Vanguard circle): [Counterblast 1, soulblast 1, choose a card named "Sovereign Black Dragon, Aurageyser Dragon" in your generation zone and turn it face-up, choose two of your rearguards, retire them] When this unit attacks a vanguard, you may pay the cost, if paid, reveal two cards from the top of your deck, during this turn, for each grade 1 or lesser card revealed by this effect, this unit gets Power +5000. Put the cards revealed by this effect into your hand. Aurageyser was originally envisioned by the Research & Development staff to synergize with Claret Sword Dragon, his corresponding grade 3. By superior calling a Swordbreaker with Claret Sword's on-stride skill and drawing from that Swordbreaker, then her as part of Aurageyser's cost to reveal and add two cards to hand, you set up a net +2 in card advantage when striding over Claret neutrally and consolidate your rearguards into your hand. Counting the triple drive, two additional cards from Aura's skill and the draw off of Swordbreaker, you will put six cards into your hand on that turn. This is offset by all but one of those cards being known to the opponent. A sufficiently skilled cardfighter can memorize everything that Aurageyser has added in terms of (at least) your guard power, if not knowing the cards by name. 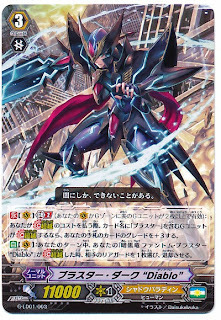 While Aura does not fully address Ildona's longstanding problem of drawing into trigger units, he does compensate for it by getting +5000 power for each grade 1 or lesser card revealed by his skill, effectively still gaining the power if not the effects of the triggers and during that reveal temporarily turning all remaining grade 1 cards into trigger units that can exclusively be applied to the vanguard. In light of this current brand of Shadow Paladin's emphasis on superior calling grade 1 and lesser cards this can be a difficult sword to balance, as superior calling units interacts with Aurageyser in a strange way by actually decreasing the number of valid targets for his skill. The incentive to run Swordbreaker does conflict with Aurageyser's soulblast cost. 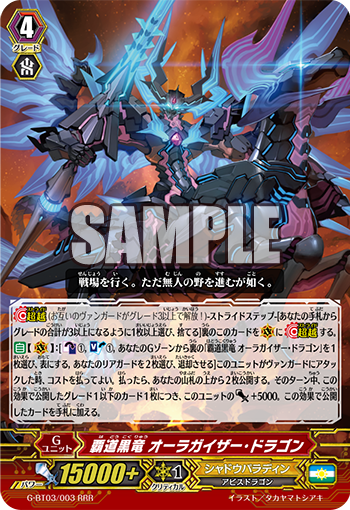 In decks that make use of Phantom Blaster “Diablo” or Blaster grade 3s, Darkheart Trumpeter is also contending for that limited resource, and the latest first vanguard option described below does not move into the soul. This means that to have space for multiple Swordbreakers/Darkhearts and Aurageysers in the same game, one must run Creeping Dark Goat, Judgebau Revenger or Fullbau Brave to build up the available soul. Otherwise one is left with just the grade 1 and 2s in the soul, which makes room for two Aurageysers but no Swordbreakers nor Darkhearts, or vice versa. Running the new move-to-soul draw trigger Howl Owl is an option, but also neutralizes any card advantage gained from these soulblast skills because putting Owl into the soul is itself a negative action. One means of getting around this is to limit Aurageyser to a first-stride utility play. The game-ending turns will typically be spend on Phantom Blaster “Diablo” rather than on Aurageyser, so planning to use Aura only once is an effective means of planning around his soulblast cost. You can run two copies of Aura for the initial stride, four copies of “Diablo” for the two turns after that, and then two of another stride like Blizza or Atmos that can catch the opponent unawares. Aurageyser is relevant to more than just Claret Sword. Ironically, Blaster Dark “Diablo” benefits immensely from running at least two copies of Aurageyser in the generation zone, as Dark “Diablo's” primary shortcoming is his slowness and utter dependency on Phantom Blaster “Diablo” to function. Blaster Dark “Diablo's” generation break 2 allows him to stride a Blaster unit using any card for the cost by giving that card grade +3, but as a generation break 2 the skill will not come online under normal circumstances until the third stride or later. This is much later than decks like the Revenger subclan are going off, putting Blaster Dark at a severe disadvantage. What Aurageyser does is address this by getting two G units face-up on his initial stride, making Dark “Diablo” live a turn earlier and allowing an immediate stride into Phantom Blaster “Diablo” just from discarding a grade 0 unit for the cost. "Always. More than anyone else." Finally, we have the second card of the day that Aurageyser's been paired with, Cutting-Edge Knight David. Befitting his name, David is a truly state-of-the-art first vanguard with a generation break 1 skill similar to that of Pitch Black Sage, Charon. When David would be used to pay the cost of one of your own retire skills, he can instead be treated as two units, effectively decreasing its cost by one. While Charon requires a Blaster vanguard for this, David instead accomplishes it by being a generation break 1. With Aurageyser this means that you create a net +1 in card advantage by using David to pay the cost, retiring one card to draw two, and you can reduce Claret Sword's generation break to a net -1 instead of a -2 to pay for a stronger late game offensive. One unorthodox trick the anime series has advocated is running multiple copies of David in the deck and superior calling them with Claret Sword's on-stride skill to grab net card advantage off of Aurageyser without exhausting the soul for Black-winged Swordbreaker. This is not without precedent. Deletor cardfighters worldwide managed a similar strategy with Acquire Deletor Igor not long ago, and still depend on that strategy heavily. Using David in this way also circumvents Revenger matches using Blaster Dark Revenger “Abyss” to retire him. However, it comes at the risk of being forced into a G Assist or even gradelock by having to shave off grade 1, 2 and 3 space to make room for the extra copies of the first vanguard, and whether this is worth it or not to make multiple Aurageyser turns play out positively is up to the individual fighter to decide.